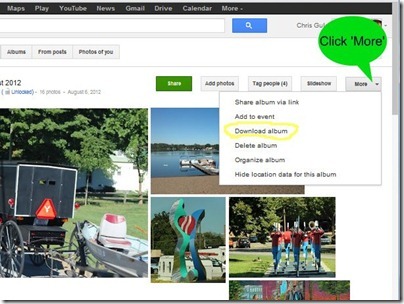 download photo album from google+ – Learn Picasa and Google Photos! Picasa Tip: Yes you can Download an Album from Google+ Photos! If you have been patiently waiting for the features in Google+ photos to catch up to what we’ve had all along in Picasa Web Albums, your patience was rewarded this week. One by one, the features we’ve come to expect from PWA are being added to the Google+ interface, and the latest one is the ability to download albums. While you’re viewing an album in Google+ Photos, you should see a menu option in the upper right labeled ‘More.” Just click on the drop-down arrow to reveal the list and you should see Download Album as an option. Click that, select your download location and click save. This will put all the album’s photos into a packaged ‘.zip’ file, so there’s one more step before you’ll see your downloaded photos in Picasa. You need to UNzip that file (Windows: right-click and Extract all, Mac: open .zip with archive utility) and put the resulting picture files into a folder in your My Pictures area – or any other folder that Picasa is watching. That means that the owner of the album has UNchecked their Google account setting to ‘Allow Viewers to Download Photos.’ This is an account-wide setting, it is not something that can be controlled for individual albums. To find the setting, click on the Gear icon, click Settings, and scroll down to the Photos section. Here is a tutorial video showing you exactly how to download an album from Google Plus. This is just one of many tutorial videos on Picasa available for Geeks on Tour members. You can see the whole list here.